Part of the 1827 map. The map that is included in Smart's Trade Directory of 1827 shows very few buildings alongside this part of the canal. On Corn Hill there is the Old Steam Mill, and Danks and Company's wharf. Just north of the site of today's High Level Station is a basin leading to Adams's Lime Works. The firm is listed in Pigot & Company’s Directory of Staffordshire for 1842 as James Adams, Lime Burners, foot of Canal Street. The wharf was known as Lime Wharf. One of the main wharves in the town centre was Can Lane Wharf and basin, which is shown on the map as a very short basin, opposite the entrance to Adams's basin. 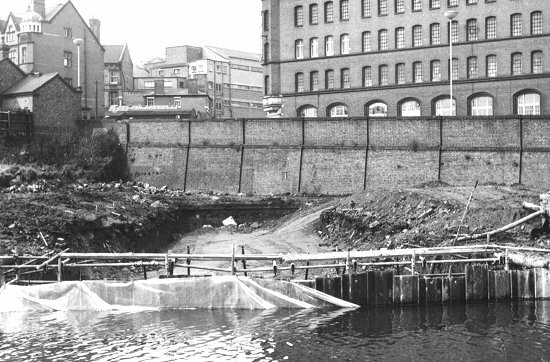 There was also an entrance to the canal at the junction of Can Lane and Broad Street, which was used by some of the packet boat companies that took passengers to and from Birmingham. This area, later referred to as Broad Street Wharf was used by coal merchants Beebee Brothers in the 1930s. Because the canal followed the 473ft. contour around hilly Wolverhampton, it avoided the town centre, and followed a route to the north east. By the time the 1842 Tithe map had been surveyed, Can Lane had become Railway Street, and Can Lane basin had been greatly extended. The layout of this part of the canal soon changed with the coming of the railway. 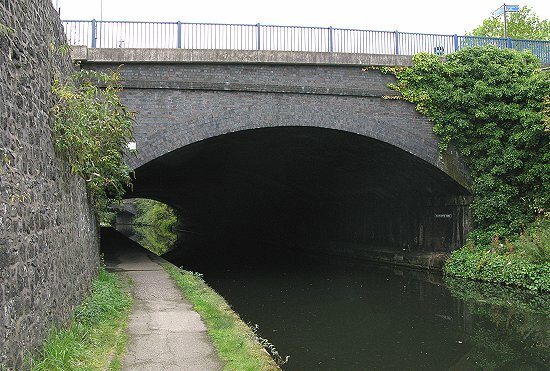 When the Shrewsbury and Birmingham Railway, and the Stour Valley Line were built in 1849 to 1851, the canal was diverted to its current path, in a cutting stretching from Corn Hill, almost to Broad Street. The two ends of the original section were left as basins at Corn Hill, and Broad Street. 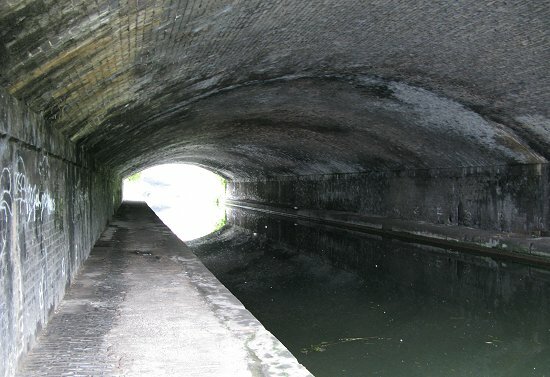 The approach to the new railway station was over the canal, and so part of the cutting was roofed-over to form a tunnel, now known as Wolverhampton Tunnel. From the 1842 Tithe map, with the addition of the new canal. The northern end of Wolverhampton Tunnel. In the early 1880s the old Lichfield Street was widened, and extended from Princes Square to Victoria Square. 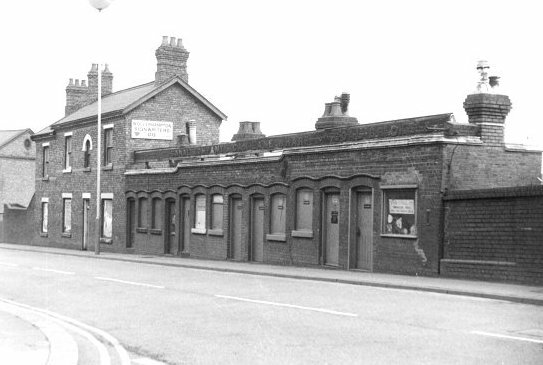 This then became the main approach to the railway station, instead of Queen Street. As a result Railway Drive was built from Victoria Square to the High Level Station. Part of the work consisted of extending the canal tunnel to accommodate the new road. This is shown on the illustration opposite, which is from the Midland Counties Express, April 9th, 1881. Another view of the northern end of the tunnel. The nearest dark line in the roof marks the end of the original tunnel, and the beginning of the extension. 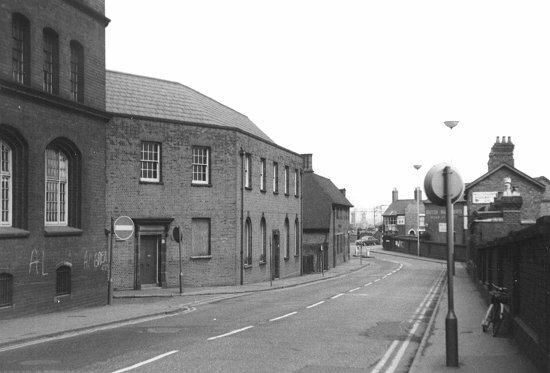 The canal company's warehouse and offices were located in Railway Street next to Can Lane Wharf. The wharf has been used for the unloading of coal, limestone and bricks etc. 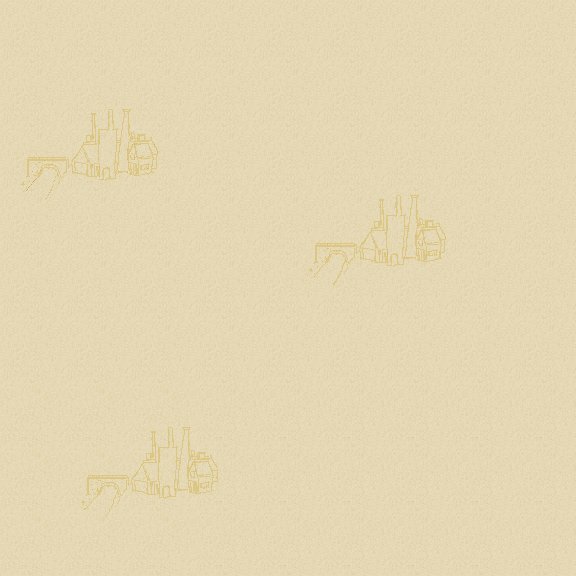 Over the years many coal merchants have been based there. In 1851 Richard Brawn was based at the wharf, selling coal and lime. In the late 1870s the wharf was used by Elias Crapper and Company, lime merchants, and Fred Walker and Company, coal merchants. Another coal merchant, J. H. Shepherd & Son used the wharf around 1913. In the 1930s two coal merchants were located there, Harley & Son, and B. H. Smith, and in the 1940s the F. and B. Coal Company (Wolverhampton) Limited, and T. J. Wright. In the early 1950s the wharf was used by coal merchants A. J. Baugh, the Astbury Delivery Company Limited, H. L. Devine Limited, P. W. Bright, and Thomas Meredith. Another coal merchant, T. Foster and Son was based in Railway Drive, as were the Economic Coal Company in 1913. The canal and wharves in 1919. On the southern side of the wharf, in Railway Street and Railway Drive was the saw mill and timber yard of C. Walsh Graham Limited. The canal company's buildings in Railway Street. Courtesy of David Clare. Looking down Railway Street towards Broad Street in the early 1970s. 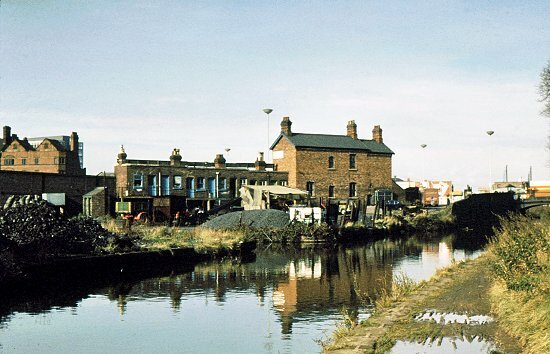 Can Lane Wharf and the canal company's buildings seen from the canal in the early 1970s. At the time it was used as a coal wharf. 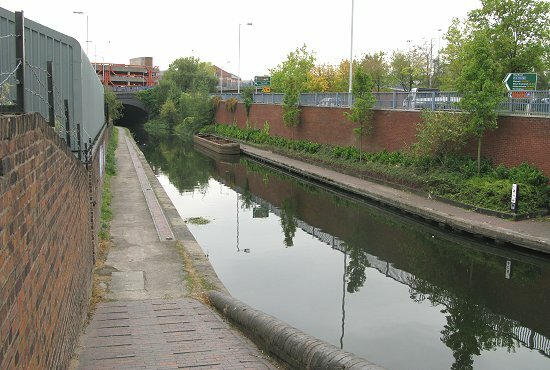 The strip of land alongside the canal between Can Lane Wharf and Broad Street was used for the Swift Packet Boats that carried passengers between Wolverhampton and Birmingham in the 1840s and early 1850s. The Swift Packet Company was owned and operated by James Shipton whose canal carrying business was based at Albion Wharf. The company began to operate on 1st August, 1843 using Scottish built iron boats. The boats were pulled by two horses, the leading one was blinkered, and the second one ridden. The horses would be changed every 4 miles or so and could reach speeds of up to 10 miles an hour. The packet boats were given priority at locks, and operated for 6 days a week, Sundays excepted. Shipton had to pay a high toll for using such fast boats on the canal, which would have damaged the infrastructure. In 1843 there were 2 return trips daily, which covered the 13½ miles to Birmingham in 2 hours and 10 minutes. There were first and second class cabins, called the chief cabin, and the second cabin respectively. In 1843 a first class fair from Wolverhampton to Birmingham was 1shilling and 6 pence, a second class fair cost 1 shilling. By 1846 there were 7 return trips a day, but by 1851 the number had been reduced to 4. Swift Packets to Dudley and Birmingham from the wharf, Railway Street at 9 and 12 in the morning, and 3 and 6 in the afternoon. Messrs. James Shipton, Edward Gibbs, and Charles L. Browning - proprietors. William Hilton - clerk. Intermediate stops on the way to Birmingham were made at Bilston, Deepfields, Coseley, Tipton, Dudley Port, Oldbury, and Smethwick. The business must have suffered greatly when the Stour Valley railway line opened in 1852. There were initially 8 trains a day in each direction, which completed the journey in 50 minutes. It seems likely that the Swift Packet Company ceased to operate before the year was out, because three of the boats were sold in February, 1852. 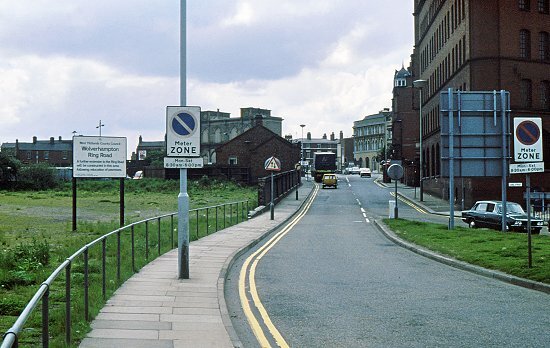 In the 1980s the canal side changed dramatically with the building of the final section of Wolverhampton's ring road; Ring Road St. Davids. 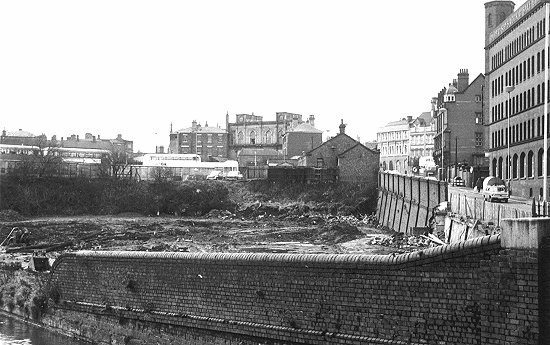 The wharves and Railway Street disappeared as the new ring road was built alongside the canal. Photo courtesy of David Clare. A scene of dereliction as Can Lane Wharf disappears forever. A last view of the once industrious area where all kinds of goods were loaded and unloaded to and from the boats. The Swift Packet Company's wharf would have been on the left, and accessed via a short walkway on the far side of the brick wall. 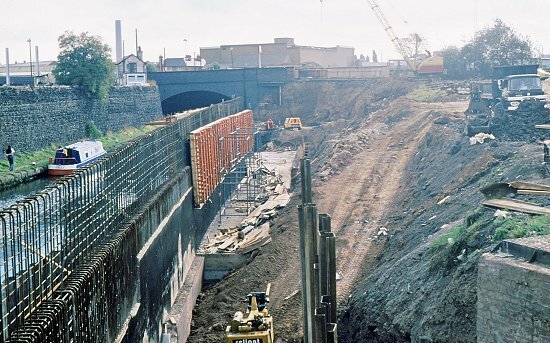 The construction work gains momentum as the retaining wall is built alongside the canal, and the area is in-filled with thousands of tons of earth. Ring Road Saint Davids, the only section of the ring road not named after a local church, was completed in the late 1980s.